Can you believe that we are in June? Almost half the year gone already. My teenagers have just moved up to their new classes and I've now got an S5 and an S3. Where have my babies gone?! Time to take a quick look back at what you might have missed in May across my social media and on the blog. The algorithms of Instagram, Twitter and Facebook don't always want to let my followers see everything I post so this retrospective monthly roundup is my cunning way of attempting to beat the system. Expect wedding celebrations, macarons, street food, percy pigs and study break edible adventures! May is clearly THE month to have a wedding so to celebrate Harry and Meghan's big day I created Lemon and Elderflower Drizzle Muffins using the flavours of the moment. The royal couple chose elderflower and lemon for their impressive cake whilst my quick and easy muffin recipe incorporates both flavours in the sponge and a sugary drizzle. Wasn't it just the best wedding ever? Who knows a community project that could benefit from £500 of funding? I bet we all do! To celebrate the launch of the McInvest Community Grant Awards I indulged in some double carbing by serving their Macaroni Cheese in a Yorkshire Pudding topped with even more cheese and crispy bacon lardon. 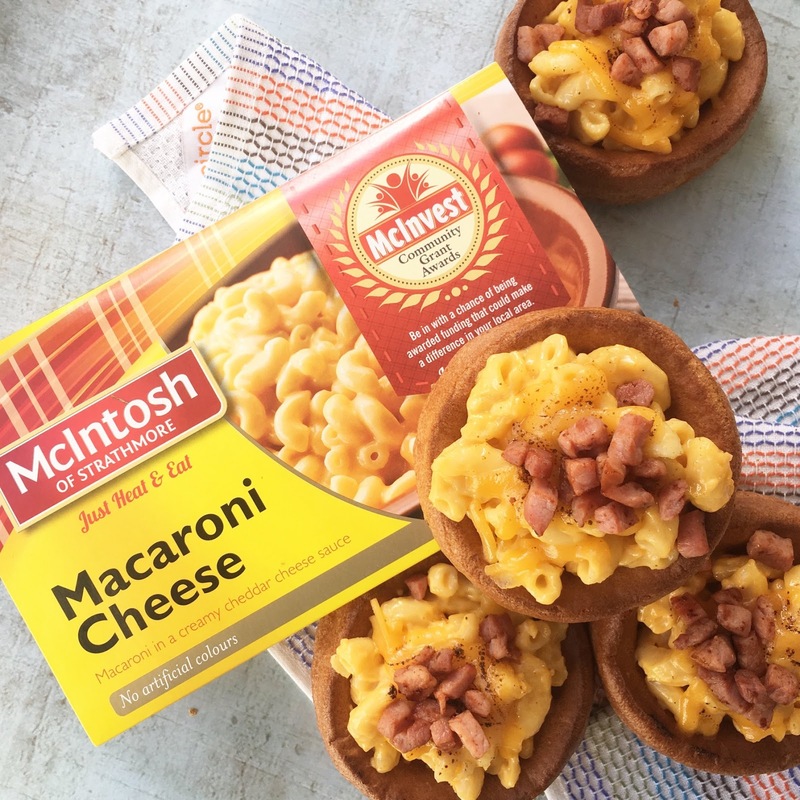 Find out more about McInvest at www.mcintoshfoods.com The application process is super easy - just apply and try! 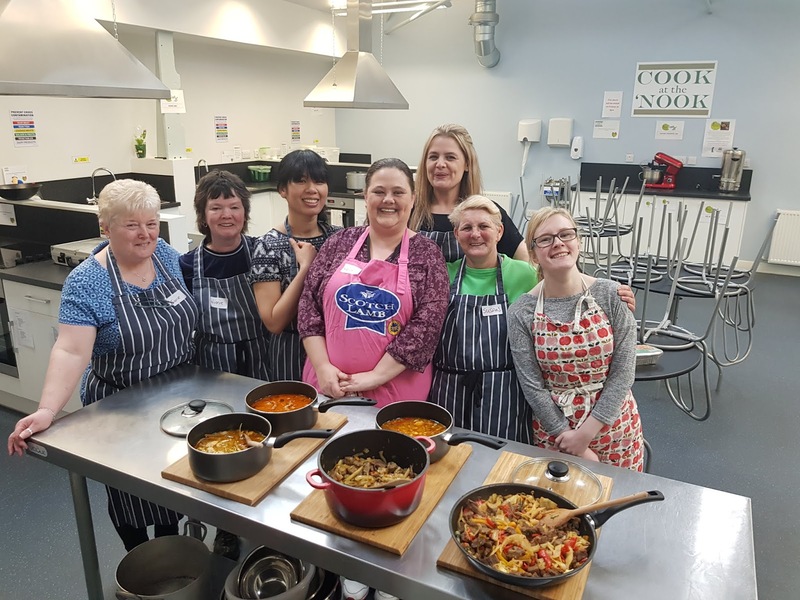 Could there possibly be a better venue for a Vegetable Cookery Workshop than the Winter Gardens in Aberdeen's Duthie Park? On a beautiful Friday afternoon as part of National Gardening Week I was delighted to host a demo & dine for 16 people (and one ladybird gatecrasher who hitched a lift with the wild garlic). Juice, fritters, pesto, slaw and salsa were eaten there and then with pickles made by all to take home. I'm always delighted to be approached to undertake cookery demos/classes/workshop so please get in touch. My son was on study leave for the whole of May as he sat his National 5's. (I was more stressed then he was. His attitude is so chilled that he's practically horizontal!) With four exams ticked off we headed down to Aberdeen beach for lunch at The Highlander Cafe Bus. Having already sampled Roys Bus at Pitcaple and Last Bus Cafe at New Pitsligo it was fun to complete the local bus trilogy! (And we spotted dolphins!) The bus serves up a combination of Romanian, Nigerian and Scottish food and is open 7 days a week. Further 'revision relaxation' came in the form of cold smoking butter, eggs, chickpeas, chicken and garlic. I really could get used to having him around and experimenting with the fruits of his labour. He also cooked up a storm of a lunchtime, lighting up the BBQ at every opportunity. Going to miss my lunchtime pal and his edible delights - roll on the summer holidays! Fritters are surely the single most delicious way to deal with a glut in the garden! These lightly spiced vegetarian courgette (zucchini) and carrot fritters contain feta cheese for a tangy flavour. Whilst my Spiced Courgette, Carrot and Feta Fritters work well as a side they are also great for breakfast and surprisingly tasty served cold in a packed lunch or picnic. These were one of the recipes that I made at my workshop in Duthie Park. 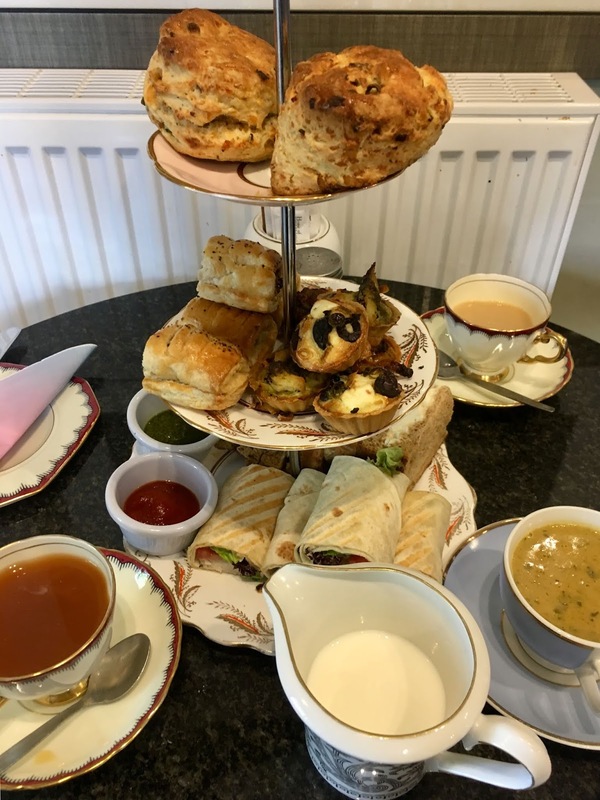 Following Nat 5 English I headed out for a fab SAVOURY afternoon tea at Corner Tree Cafe with my son. Warm cheese scones, warm sausage rolls, warm mini quiches and a choice of sandwiches/wraps served with tea/coffee. Honestly it was my idea of heaven! It costs only £13.95 per person plus £2 to add a cup of soup. Leftovers can be boxed up and taken home (not that we had any) Vegan and Vegetarian options are also available but must be booked in advance. You can also bring your own Fizz for £3 per bottle corkage charge. We came, we saw, we ate and we drank at the inaugural Aberdeen Inspired Nights Street Food Market! The sun shone on The Green for two days of food, drink and street art. With free entry folk thronged to this family and doggy friendly event. Steak, oysters, prawns, fries and gremolata from barnacles & bones. Toasties and brownies from Melt. Coffee and Cake at Contour Cafe. Pizza from Pizza Geeks. Bao Buns and Goyza from CuBao Box. Burgers, prawns, tortilla wraps at Cafe Fifty Two. A pop up bar was provided by 10 Dollar Shake within Hard Grind. Cocktails, cuts and tunes! I sneaked in with a final wild garlic recipe before the end of the season - Jersey Royals with Wild Garlic and Lemon - makes the most of both its flowers and leaves. Jersey Royal new potatoes typically signify the start of Spring and are one of the most warmly anticipated seasonal produce items in the food calendar. In this recipe I've combined them with wild garlic, butter and lemon for a taste explosion of Spring flavours. Serve this vegetarian dish as a hot side or a warm salad. With the upcoming closure of Nick Nairn Cookschool it seemed an appropriate time to give a revamp to my post detailing Cookery Courses and Foodie Experiences in Aberdeen City and Shire. At the moment it lists 17 providers covering breadmaking, plant based, macarons, chocolate, kids classes, butchery, thai, vegan, asian, BBQ and more! Please do let me know if you know of others as I'd be delighted to include them. Macarons are one of those bakes that until now I've been scared to tackle. I do however love them and pop in past Almondine for a fix whenever I'm in the West End. Clearly I'm not the only one who loves these colourful almond and egg white sweet treats and the macaron class run by Samantha at Cooks Day Off in Kintore is her most popular class (she also teaches pasta, Italian deserts and bakery, gluten free and confidence to cook) I joined a hands on class of 6 people and picked up lots of hints, tips and tricks. I've since tried at home with mixed success but I'm assure that practise makes perfect with this bake! Classes are £47 and include a 3 course Italian lunch. No sooner had I shared this recipe than I started getting tagged by folk in posts about the possibility of Percy Pig being banned! Apparently they may be a victim of a government review into sugary products that use cartoon characters as a means of promotion. So don't delay and get them on the BBQ whilst you still can! Looking forward into June my plans include the Chariots Beach Run in St Andrews (been there, done that, got the T-shirt and eaten the donut! ), weekend away with friends at Loch Lomond, Kitchen Table for Maggie's, Maggie's Culture Crawl, Auchenblae Food Festival and Afternoon Tea at Gleneagles.